Accessory Genie - Consumer Electronics and Accessories Industry News: Free Camera Pan Head Mini Tripods! No Purchase Necessary! Free Camera Pan Head Mini Tripods! No Purchase Necessary! Tripods are great for taking still shots removing the shaky hand syndrome. Tripods are essential for shooting in low light and moving objects. Tripods also help give you a different perspective on the shot that you might have otherwise missed. There are thousands of different tripods on the market. Smaller tripods are better suited for portable cameras that do not weigh as much as a professional camera. Larger tripods are made to support the weight from professional cameras with large lenses. Different cameras use different tripods. 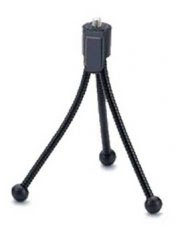 There are two main types of tripods, ball head and pan head tripods, both serving different purposes. Ball head tripods swivel, as the head loosens up to move the camera in all directions. The pan head tripod requires two adjustments to alter the cameras position. Ball head tripods allow for easier movement and adjustment of the camera, but cannot support heavier weights like the pan head can. The pan-tilt head will take longer to adjust, but will support heavier loads, especially if shooting a vertical shot. Tripods range in price from $15 to $100 for a high end. To claim your free tripod from Accessory Genie simply enters the promotion code: “09AGTR10” upon checkout and you will receive a free tripod. This offer is valid until April 4, 2010. You do not even need to make a purchase to receive your mini pan head tripod courtesy of Accessory Genie.